the seventh round of free trade negotiations between India and EU held at Brussels in mid-July ended in a deadlock after the negotiators disagreed on the modalities of the agreement. Fresh talks will be held in November to thresh out details of the free trade agreement (fta) to ease movement of goods and open up retail, services and insurance sectors in India to foreign investment. Civil society groups including international humanitarian organization, Medecins Sans Frontieres (msf), warned the proposed agreement would endanger India's food security and make generic drugs very costly. Some of the details of the EU-India draft agreement were leaked to the press earlier this year and appeared on a website. Article 9.3 in the draft agreement with EU would compel India to extend patents monopoly, currently for 20 years, by another five years. This would delay entry of less expensive generic drugs in the market, msf said. The draft agreement also provides for what is called data exclusivity right that works like a patent monopoly. This would make even generic drugs expensive, the activists said. Indian generic drug manufacturers who have brought down cost of several drugs like the ones for hiv/aids and tuberculosis will be affected. Such provisions go beyond what is mandated by the World Trade Organization and Trade Related Intellectual Property Rights, they added . Shalini Bhutani of non-profit grain said the agreement would harm farmers. The draft agreement says any new seed or genetically modified plant variety can be patented. This would prevent farmers from using seeds from these plants for commercial crops or sharing them with others. "Such an agreement implies signing away India's food security," Bhutani said. Biotech companies will profit at the cost of farmers she added. Besides the fta with EU, India is also negotiating bilateral trade agreements with Japan, South Korea and south-east Asian (asean) countries. About 30 ftas are under negotiation right now. 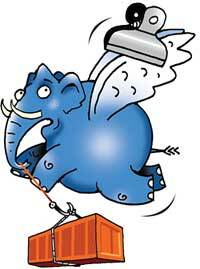 Experts from Thailand warned India against an fta with Japan. "Japan has always used Thailand as a dump for its toxic waste. A Thai-Japan fta has now made the practice legal and binding. There is no way Thailand can stop Japan from dumping waste," said Jiraporn Limpananont and Kannikar Kijtiwatchakul, academics affiliated to fta Watch, a non-profit. Intellectual property rights expert, Gopa Kumar said there should be no ftas with developed nations as India is not in a position to compete with them. Joint secretary commerce Dinesh Sharma said the EU-India agreement details could not be disclosed till it is finalized. On the Indo-Japan fta, Sharma said he was not aware of clauses relating to waste dumping.